I am a sucker for any novel described as being a gothic horror; it is one of the few things that make my eyes glaze over when dreaming of the possibilities. A lot of times it is hard for an author to match what the reader wants, especially in terms of writing horror. April Genevieve Tucholke weaves the perfect amount of horror and mystery into this paranormal novel. I was very taken by the way in which the atmosphere of the novel plays into the action of its characters, there was a perfect balance between the two and it made for a much more dramatic reading. Let’s talk characters, Violet is strong and careful, she is more mature and responsible than a typical 17 year old as she has practically raised herself since her parents have been gone, she also misses her dead grandmother terribly and often talks to her as if she were still alive. Her brother Luke is somewhat reckless and where Violet has matured in their parent’s absence, Luke has developed a more obvious “craves attention” sort of personality. Sunshine is their neighbor, and is described as beautiful with sleepy and seductive brown eyes. If I am being honest, I didn’t like Sunshine at all, and I didn’t like the way that Violet compared herself to Sunshine constantly, though it did give the reader insight to Violet’s lack of confidence in herself. It was perhaps because of this confidence that Violet fell so fast for the gorgeous River West. River is good looking in a “vintage” way, with a gorgeous crooked smile. He is a very manipulative character, which obviously plays into the story, but I have to be honest I was a little frustrated with him and his constant evasiveness. Their relationship was pretty seductive, even though it did read somewhat like the paranormal romances we are used to. You know the kind where the girl “can’t stand” this guy and his ways yet she just can’t stop kissing him? I can’t complain though, because those kissy scenes? Oh, they were worth it. Lot’s of people have bad stories, and if they wail and sob and tell their story to anyone who’ll listen, it’s crap. Or half crap, at least. The stuff that really hurts people, the stuff that almost breaks them…that they won’t talk about. Ever. Though overall I adored Between the Devil and the Deep Blue Sea, it wasn’t perfect. I didn’t really appreciate the so often seen “absent parents,” and how Luke and Violet are still in high school yet they somehow manage to learn to live on their own with no guidance or structure. I see how it was necessary to leave the parents out of the main storyline, but I would have felt better about it had Violet and Luke been a year older or perhaps been taken care of by an eccentric family member. This didn’t affect my overall impression of the novel but it was something that bothered me while reading it. On the whole, the novel was beautiful and atmospheric, the description of Citizen Kane, the large house where Violet and Luke live was absolutely breathtaking, I found myself wanting Violet to explore more so I could learn more about what was hidden in the corners of the attic. I also particularly enjoyed the ending of the novel. Some readers are saying that they felt the ending to be rather rushed, and though I can see that in a way, I also think it was necessary for the novel to progress in this way in order to set it up for the continuation of the series. I also did not see the ending coming, I had musings, to be sure, but the revelation at the end was quite a surprise. 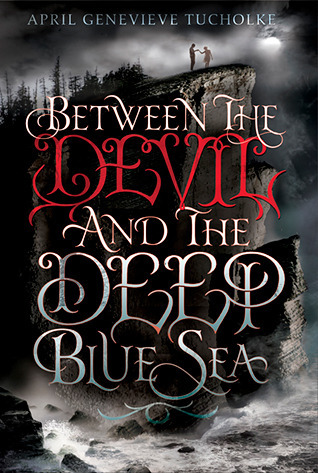 I highly recommend Between the Devil and the Deep Blue Sea to anyone looking for a descriptive and atmospheric novel. It is filled with enough mysterious and creepy elements to keep even the most jaded reader looking over their shoulder, also let’s not forget about the swoony bits as those are aplenty as well! This entry was posted in Reviews and tagged fantasy, gothic, horror, love, mystery, paranormal, romance, supernatural, young adult. Bookmark the permalink. Hmm, I’m quite curious about this book now. Would you say it’s kind of creepy? Because for some reason I love creepy books. Yes the atmosphere was very creepy and there were some horror elements but it wasn’t too gory or anything. I really enjoyed it, you should definitely give it a go! Oh A, your reviews are just so lovely!!! I’m still really interested in this one, but you know… Horror. Eek. Think it’s a good read even for a scaredy cat? I haven’t had much luck with creepy, atmospheric novels (see: Strands of Bronze and Gold) this year, but this sounds interesting. I do like the title a lot, and I love the fact that the author really wrote the atmosphere well. HOWEVER, the typical paranormal/YA elements of absentee parents and good girl-bad boy romance are throwing me off a little. We’ll see if I decide to read this one in the future!